Let’s play a word game! If you see the word “lo-cal,” what does it make you think of? For us, it’s “healthy,” sure -- but it’s also “flavorless” and “how soon can I consume something with a normal amount of calories in it?” And so it was to our surprise when we learned that the beloved craft brewery Dogfish Head released Slightly Mighty, a self-described lo-cal IPA that contains all the hops you’d come to expect from an India Pale Ale, and none of the carbs. We cracked open a can to tell you if it delivers on its promise of an IPA’s taste, and how it stands up next to one of the leading low-calorie IPAs currently on the market. 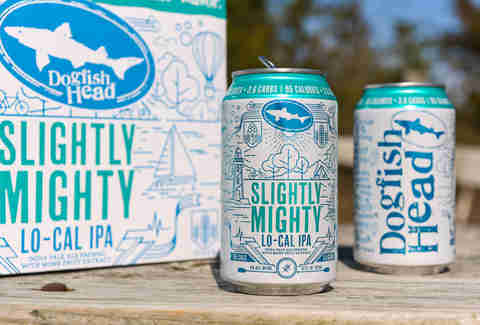 Is Slightly Mighty worth the almighty dollar? Let’s find out. Normally, the only two numbers that matter when it comes to an IPA are the ABV and the number of IBUs. But because this is a beer is aimed at people who potentially follow a low-carb diet, a new set of numbers become more important: 95 calories, 3.6g carbs, 1g protein, and 0g fat per 12-ounce serving. And sure, it also only has a 4% ABV. Even more interestingly, the beer is brewed using monk fruit extract -- an ingredient you’ll likely recognize if you follow a low-carb or keto diet, and regularly consume stuff made with sugar substitutes. The brewery said the extract “amplifies the body and complexity in the beer.” As Men’s Health noted, monk fruit is carb-free and calorie-free, two huge pluses for keto fans. It’s also much sweeter than sugar, without all those pesky carbs. It's not 100% keto compliant, but as a cheat, it's a good bet. Right off the bat, it looks different than your average light beer. There’s a beautiful gold color emanating from my pint glass, and the aromas are on point: it smells like hops! Holy moly, they’ve done it! Granted, I haven’t taken a sip yet. I should do that. After a few long pulls from the pint, it’s clear that it doesn’t taste like what I expect from a Dogfish IPA. But it does taste like it’s in that ballpark. Granted, this beer has nosebleed seats, but it’s in the damn ballpark, and that’s the key. It’s not hoppy, but there’s plenty of delicious pineapple notes, and it wasn’t watery in the way many light beers tend to be -- more on that in a bit. I even found that taking a big ol' whiff of the beer’s plentiful hop aromas before I took a sip enhanced my experience. How does it compare to mass-produced light beer? This beer fills in nicely as craft beer’s answer to the best-selling light beers brewed by macrobrewers like Anheuser-Busch InBev and MillerCoors, so it was only fair that we taste Slightly Mighty next to another low-carb beer. The nutritional content of this generic light beer is close to the Dogfish low-calorie beer when it comes to ABV, calories, and carbs. If you ever have a choice between these two beers, Dogfish is the one to reach for: it’s the beerier of the two, and you won’t feel like you’re drinking beer-flavored water. 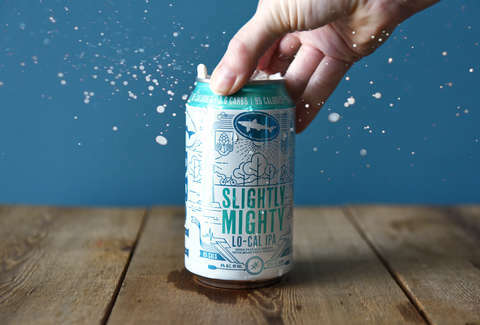 Sure, Slightly Mighty doesn’t have the hop character of a West Coast IPA, but it also doesn’t have the calories either. It’s the sensible choice for when you want a beer, but not any self-loathing for consuming too many carbs. This is the same brewery that took apricot IPAs into the mainstream; revolutionizing the low-carb beer is practically a cakewalk. Lee Breslouer writes about food and drink from Colorado, takes photos of beer @LeeBreslouer, and remembers his first Chicory Stout like it was yesterday.